The music and voice in the above video was produced at Full Blown Studio for our client. The video editing was also done in house. Full Blown Studio operates a Pro Tools multi-track digital recording studio which enables us to record multiple takes quickly. The recordings are better than CD quality 24bit digital audio at 96kHz sample rates. 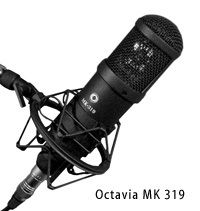 We use primarily the Octavia MK319 Condenser microphone for increased fidelity. The mic is a fixed-pattern, cardioid, large diaphragm mic intended for studio and broadcast usage resulting in a smooth frequency response from 40 hz to 16khz, with a gentle presence rise giving especial warmth and clarity to the human voice. 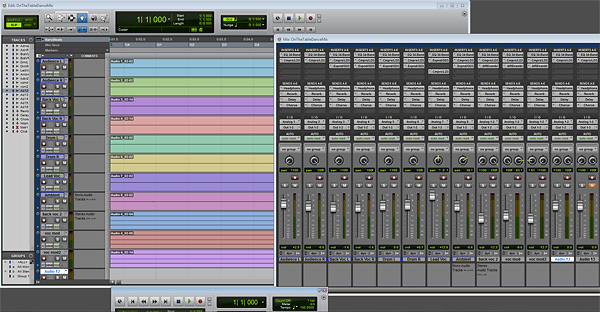 Coupled with a Korg Triton Workstation/Sampler we can create music loops and background music for almost any project. Recording high quality audio is critical to any podcast or video project. You might have a great product and create the most engaging videos possible, but it all falls apart if the audio quality is not very good. Sometimes it makes sense to consider paying for professional narration. If you have the money, this is a viable option. However, many of you on a tight budget. If you do have a limited budget (or you want to do the narration yourself) then here are some tips to help you do the best job possible. Let's look at the microphone and recording environment. When it comes to microphones, you typically get what you pay for. A more expensive mic is generally going to reproduce higher quality audio. This isn't to say that you can't make do with an inexpensive microphone. I've worked for plenty of organizations that had no money and forced me to buy my microphones at an unnamed electrical store. For the most part, they worked fine, especially if you follow some of the tips below. But the truth is that when you compare the acceptable low-quality audio with similar narration recorded with a better microphone, there is a noticeable difference. The good news is that you don't have to spend a lot to get a decent microphone for recording narration. I've had success with a Plantronics headset and my Samson desktop mic. The Blue Snowball mic looks cool and it has also gotten very good reviews from those I know who use it. If your goal is to record narration, your best bet is to go with a unidirectional mic. 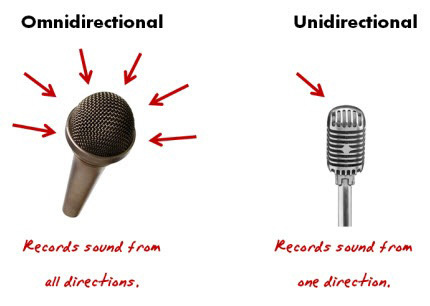 It records sound from one direction. This is great for recording narration because it only picks up the sound coming from the narrator, so you won't get a lot of the ambient noise. In an ideal world, you have a recording studio where you can control all of the sound. But since it's hard to get your boss to fork over $5 for a stock image, you might not convince him to provide the money for a recording studio. In that case, you're going to have to get creative when you record. The more you control the recording environment the better quality audio you can record. One key is to develop a consistent routine for recording. It never fails that you'll have to do retakes, but by maintaining a consistent environment and procedures you're better able to match the audio quality. Try to use the same room and maintain the same settings on your computer and the microphone set up each time. If you're using a desktop microphone, use a mic stand and measure the recording distance so that the next time you record you have the same set up. 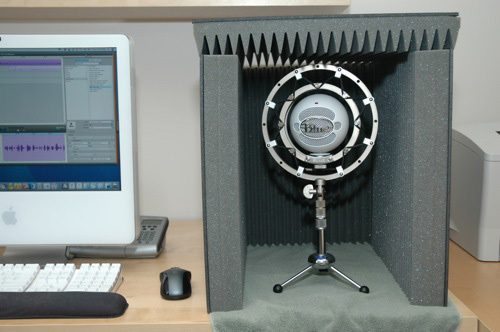 Use a screen to help prevent the popping p's that plague so many amateur recording sessions. 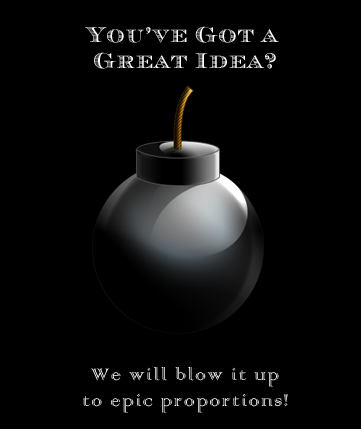 You can even make your own in no time and little cost. Unless you're a member of Quiet Riot, you want to get rid of the noise. There's very rarely a time when there is complete silence. This will be very apparent as you listen to your recording and start pick up all sorts of noise. In fact, there are some organizations that actually pipe in "white noise" to make it easier to concentrate and be less distracted by surrounding conversations. In any case, you want to get rid of the noise you have control over. Unplug office machines. Turn off fans and air conditioners. Place your microphone away from your computer. You might not realize it, but your computer makes a lot of fan noise.Tell everyone around you to be quiet. Put signs on the door, etc. In a recording studio, the walls are designed to absorb the sound waves. You can do something similar on a budget. You can create your own inexpensive sound booth. If your budget allows, you could buy a Porta-Booth.